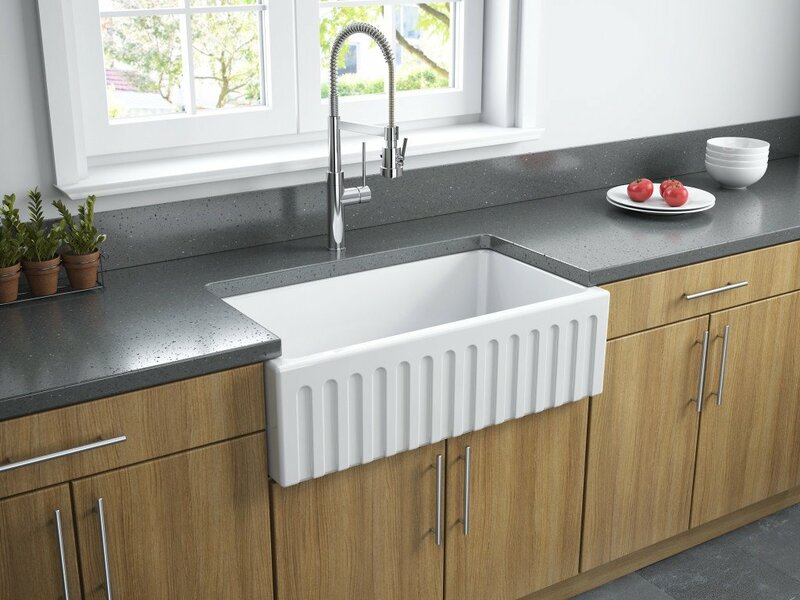 The Latoscana LFS3318W is a truly premium, high-end fireclay kitchen sink. It’s absolutely worth the slightly higher price that it asks for than some of the other semi-premium sinks on the market, especially if you’re looking for something that will be held up nicely even after years of heavy-duty use while also maintaining a great look. Let’s take a look at some more of its highlighting features below. Perhaps the first thing that you will notice about the LFS3318W when you unpack it is its reversible design. It has a smooth, front apron design on one of its side and a fluted, decorative and unique design on the other. This means that you can choose the design that suits the overall look of your kitchen better. For a modern, elegant kitchen theme, letting the smoother side of the sink being visible would serve you better. However, for a livelier and uniquely designed kitchen, the fluted design will perfectly complement its overall look. As we said at the start of this review, the LFS3318W is a truly premium kitchen sink. After all, there’s a reason there are customers saying that something like this little beauty would easily cost an arm and a leg if you were to get it at a local store. However, you get it for much cheaper at Amazon, and given the fast shipping with careful packaging, there’s absolutely no reason why you wouldn’t want to save so much money by simply going with Amazon. You would also be covered with their amazing return or refund policy so there’s hardly any risk involved. However, we are sure you will be so pleased with the way it enhances the look of your kitchen that you will never feel like it was an expensive purchase. The customer that bought it get great compliments from their guests, as it does look gorgeous and beautiful. It also feels very smooth, unlike some of the other sinks in this price range that try to establish themselves as a “premium” sink but have a rather rough feel to them. Now, this is something that you MUST take very seriously. One of the most frustrating things about buying a high-end sink is that it gets scratches in just a few months of use. This is something that can get very disappointing, as you would obviously expect better for the price. However, many times, manufacturers are so obsessed with making their sink look great and have a premium feel (so that it can qualify as a high-end sink!) that they don’t try to focus as much on the functionality. And this is precisely where the LFS3318W absolutely blows these sinks away. If you go through the customer reviews of this product, you will see that customers that have been using this sink for a few months now have not even a single scratch to complain about. It looks as shiny and gorgeous after a few months of use as it does when you unpack it, and that’s saying something, given many of these high-end sinks are quick to lose their appeal over a period of time. What’s more, it also seems to be extremely resistant to stains and other issues, which speaks volumes about its durability and ability to maintain its great look. 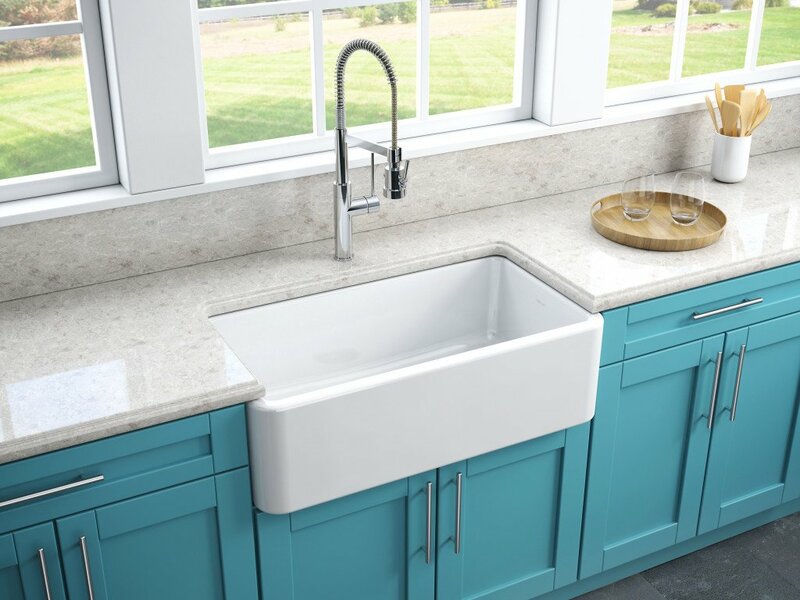 As you can tell just based on the three features we discussed in detail, the Latoscana LFS3318W is definitely the real deal when it comes to premium fireclay kitchen sinks. However, something to keep in mind here is that its price tends to fluctuate quite a bit. This is probably due to the fact that many times, the seller that sells the LFS3318W at the best price goes out of stock often (which isn’t surprising given the great value this sink offers! ), and the other sellers sell at a much higher price.